This is part five of a six part series related to a JavaFX 2 Game Tutorial. I know it’s been a long time since I blogged about gaming, but hopefully you’re still with me. If you would like a recap, please read Part 1, Part 2, Part 3, and Part 4 to find out where we left off. If you are up to date, then let’s get started! In this blog entry we will be incorporating sounds into our game. There are many elements which make games incredibly fun such as animated effects, collisions, AI, and input. However, one of the most important ingredients to game play is sound. When games incorporate sound effects and music, the gamer will become highly immersed (ugh… like not realizing you are about to see the sun rise). Before we get into the details, let me give you some background history on sound used in PC games for the home computer. If you want to skip the history and get down to business, jump to the section called the ‘Sound Manager Service.’ The Sound Manager Service is responsible for maintaining sound assets used during the game. If you are really impatient and don’t care about the implementation details, jump down to ‘JavaFX Sound Demo.’ Important note: Remember to read the requirements before launching the demo. Back in the day, when I was growing up, I learned that the Apple ][ computer was capable of playing sounds. The Apple ][ had one speaker that was only able to produce simple tones (8 bit mono sound). When I first generated tones (Mary had a little lamb), I was totally amazed. If you are interested in machine code using Applesoft Basic’s peek and poke commands to compose music, visit 8 bit Sound and Fury. Even though 8 bits seemed very simple (because there were so few values), it was not. When creating sound effects for games, one of the most difficult things to manage was the timing or duration of the tones in conjunction with the sprites flying across the screen in a (near) simultaneous fashion. In the 90s during the reign of the Intel x86 architecture (the PC), the most popular sound card was called the Sound Blaster 16 made by Creative Technologies. In its prime, this sound card was quite amazing when playing games because it was a separate card having a chip set with the ability to play midi sounds and music in stereo (two channels). The sound card was bundled with a CD rom player allowing one to pop in a music CD. Another cool feature of the Sound Blaster was its 15-pin MIDI/Joystick multiport enabling game input devices to be connected. Today (the future), sound cards are able to support surround sound (3D audio effects), various sound formats, record, various music formats, midi, and mixing. Multitasking enables modern computers to play sounds/music on parallel tracks (simultaneously). Next, we will be creating a sound manager service that will be added to the game engine framework library (JFXGen). 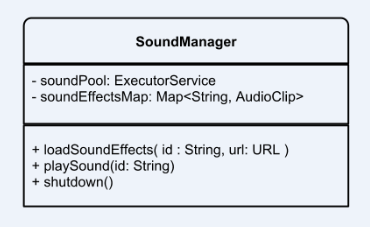 The GameWorld class contains services such as the sprite manager and (more recently) a reference to an instance of a SoundManager (singleton). The sound manager service is responsible for managing all of the game’s sound effects. This service allows the developer to load sound clips (AudioClip) using the loadSoundEffects() method. After loading sound effects each audio clip can be retrieved using a unique id (String) mapped to the sound. The last method is the shutdown() method. When the application is exited, the stop method will invoke the GameWorld‘s shutdown() method which, in turn, calls the SoundManager object’s shutdown to clean up any resources. The SoundManager instance has a thread pool that gets gracefully shutdown. Note: For brevity, I designed the SoundManager class to play simple audio clips, though not music, during the game. If you want to add music, please refer to the JavaDoc on the Media and MediaPlayer APIs. * Responsible for loading sound media to be played using an id or key. * Contains all sounds for use later. * Constructor to create a simple thread pool. * @param numberOfThreads - number of threads to use media players in the map. * Load a sound into a map to later be played based on the id. * @param id  - The identifier for a sound. * @param url - The url location of the media or audio resource. Usually in src/main/resources directory. * Lookup a name resource to play sound based on the id. * @param id identifier for a sound to be played. * Stop all threads and media players. How do I play sound effects in JavaFX? How do I play music in JavaFX? Space bar key press will toggle a force field to protect the ship from enemies and asteroids. 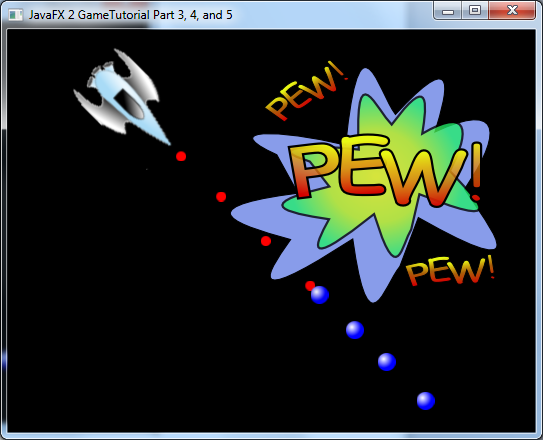 This entry was posted in Game Programming, JavaFX and tagged game, game engine, games, JavaFX, pew, ship, SoundManager, tutorial on August 26, 2012 by carldea.